Today is most definitely A Very Good Day! I finally got the enormous lie in I've been hoping for whilst I've been at work. My cheapy bargain flip flops have arrived and I had rather a successful weigh in.. I was over the moon to receive my 1 1/2 stone award, as I was worrying that having some flexi meals would stop me losing the lb I needed. However I smashed that with a loss of 5 1/2lbs! That gained me the Slimmer of the Week award, the first time I'd won it! 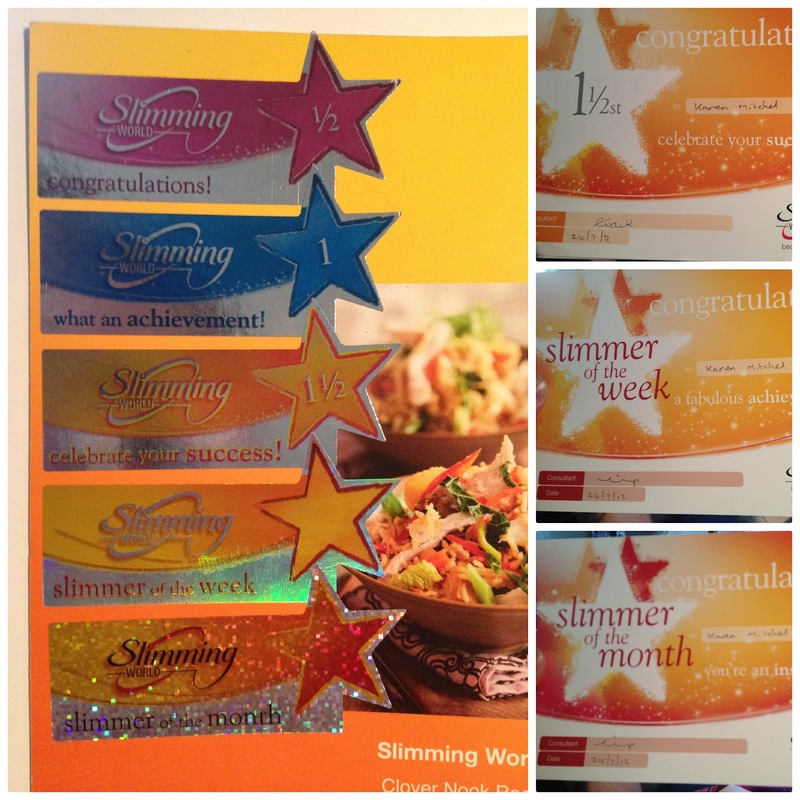 It also meant that I won Slimmer of the Month for July with my total weight loss of 14lbs this month. For those that don't go to group, the idea of stickers and certificates might be a bit silly. However for me, it's a huge motivation, it's a way of breaking the weight loss down into manageable chunks and is yet another piece of the amazing support you get by attending group. Speaking of which, if you have been following my blog and are maybe pondering joining your local Slimming World group, this week's Bella magazine contains a voucher so you can join for free - so if you've been umming and aahhing about joining, make this the week you take the plunge. You really won't regret it. I can't guarantee that your consultant will be as wonderful as mine, but I'm sure they'll be pretty damn good. For your weekly fee of £4.95 the support you get is priceless, I couldn't have done as well as I have alone! As I didn't get up until stupidly late today, and had to get out to pick up the car (Dotty) I didn't manage to get anything down me for breakfast (I know...VERY naughty), but dinner after weigh in was my favourite. ...fruit has to become part of your diet :) So tonight I have tried a nectarine for the very first time (as there were 5 in the basket) and you know what? It wasn't half bad, very juicy and so I think I'll be having plenty of fruit to snack on this week! I hope you all have weigh in's as successful as mine!